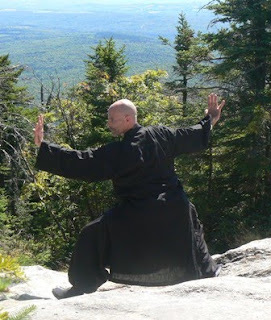 This is an article from a Master of the Chen Style of T'ai Chi Chuan that explains proper body alignment for practicing all styles of Tai Chi. He is a direct descendant of the Chen family who were the founders of the original style of Tai Chi of which all other styles were derived. I hope you find it helpful in your daily practice. During our Taiji practice, we all want our energy to flow and develop into internal strength, a sign that we are practicing Taijiquan correctly. To achieve this, we need to adjust our bodies to certain positions when we practice Taijiquan. The following are some hints on how to go about this. This is important because our legs are the base that supports our torso. Bending our knees and flex our hip joints can give you a good base. Moreover whether you can tell your substantial and insubstantial or not also depends on this. When you do standing postures or practise the routine always remember to bend you knees and flex your hip joints. When you do this and feel that you are sitting on an invisible stool and more importantly your legs are firm then you are on the right track. With constant practice you will gradually be able to feel your qi and jing sink to the bottom of your feet, and at a later stage move back up to your hands. The crotch is where your legs join or fork your body. It should be kept round like an arch so that you can turn or shift your weight easily. It can help you step forward (or backward) and yet can retreat quickly if need be. That is to say it help you have the insubstantial in the substantial and the other way round. Many Taiji practitioners make a mistake when they advise students to pull in the buttocks and coccyx during their Taiji practice. Doing so can make people develop lower back pain because this posture puts too much pressure in the lower back. Leave the buttocks in their normal position — sticking out naturally — is the solution. When qi wants to surge to the top of your head, your buttocks and coccyx will have to pull in to help qi perform this task. Your qi can circulate only if your entire body is relaxed. When you pull in your buttocks deliberately, you create tension and pressure, which can only block your qi flow, not helping it. If you leave your buttocks in their natural position, the tension will disappear. When your qi wants to go up, your buttocks and coccyx will pull in (lift your head top up and pluck up your back will help achieve this) automatically to help qi go all the way to the top of your head. After completing this duty the coccyx and buttocks will return to their normal position again. So your buttocks and coccyx will move in and out all the time if you are relax and get your posture right. In Chen style Taijiquan, the buttocks are in four different positions. Generally it is in its natural position — sticking out naturally. When your qi wants to go up, your buttocks will pull in. When you turn right, your right buttock is up slightly while your left buttock goes down slightly. When you turn left, your left buttock goes up and right buttock goes down. The torso is the main route where your energy travels. When it is upright, your energy can flow smoothly from your feet through your spine to your hands. This is beneficial to health. From the martial art’s point of view, your pushes, punches, kicks, etc. are much stronger when your torso is upright. For this reason, always keep your torso upright whether you turn right or left, move forward or backward during your practice. An easy way to keep your torso upright is to line up your shoulders with your hips. Each time you move – turn left or right, etc.- you move your shoulders and hips together. That is to move your torso as one whole piece. When you can move your torso as one unit you will find it easy to use your waist (now enlarged to become the whole torso) to move your arms. To do this your torso will have to always move first to drive your arms. Do not move your arms by themselves. This is the most important requirement in the torso methods. A good tip for this is not to tilt your head forward (to look down) or backward when you practice Taijiquan. Just keep your head upright and imagine there is a piece of string from the ceiling gently pulling the center of your head upwards. This is called suspend your head-top. Tuck in your chin can help you suspend your head-top. Suspend the head-top can help bring qi (energy or life force) from your coccyx or your feet up to the top of your head. We can say without an up right torso and an upright head there will be no qi or jing (internal strength) flow. So remember always keep your head and torso upright during your Taiji practice. After constantly practicing with this principle for a few years, you will be able to find out where your center line is. Then when off balance you can regain your equilibrium quickly. At this stage you can adjust your body as a situation arises. This means lift up the top vertebra of your spine so that your torso can be longer. Pluck up your back can help keep your body upright. More importantly it helps to make your coccyx and buttocks pull in to send qi all the way up to the top of your head. Once your qi reaches the top of your head, it will find its way down, usually through the front center line of your torso. You have to relax your chest and sink your rib-bones to provide an optimal condition for qi to come down. You should try to loosen your shoulder joints and they should feel as if they were going to drop to the ground. Do not lift your shoulders up. If you do, your energy will go up with them, your body will be floating in the air, and you can be unrooted and thrown off balance easily. Besides dropping the shoulders is the best way to make the torso and the arms work as a unit. This is to help you drop your shoulders. Try drop your elbows and see if you can feel your shoulders drop as well. Remember when you push both hands out, always keep your elbows lower than your wrists. People all know that we have to relax when we practice Taijiquan, but many do not know that we have to loosen and stretch our joints and tendons as well. When we lift our head-top up and at the same time keep our buttocks down, we stretch our spine. When we drop our shoulders, elbows and wrists, we stretch our arms. When we bend our knees and flex our hip joints we stretch our legs. Stretching our body in this way can provide good qi flow and increase internal strength. This is what torso methods are all about. But the biggest secret is to practise.